Camping is something that I have always loved. I remember as a cub going on camps and getting the chance to sleep in a sleeping bag, or going camping with my family and getting to the point aged about 10 where I was able to sleep in my own tent (right next door to my parents but still) I was on my own surviving against the elements like…. well we did not have Bear Grylls, so I guess like Action Man did. Thankfully my wife likes camping too and we have camped together in France and the UK. It seems only natural for us to have camping as something our family does. The real question is would my daughters like Camping. 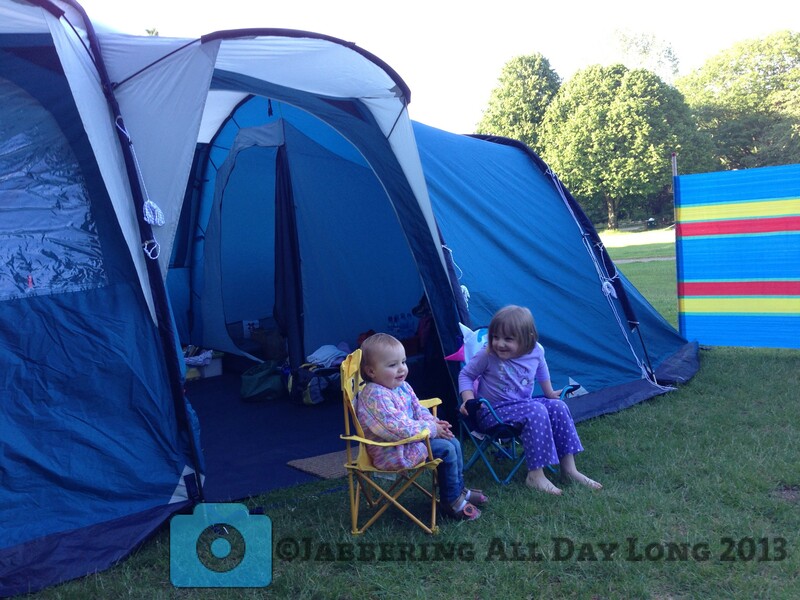 Our first family camping trip was at the end of June 2013. We chose to head to the Forest of Dean, about 40min from where I live, chosen specifically becasue it was close to home. We wanted somewhere that if everything went wrong we could just leave go home and drive out the next day to collect our belongings. Thankfully we did not have to do that. We did come home one day earlier than planned but that was due to overtired parents and the feeling that an extra day at home to pack away everything and get everything washed would be beneficial. As an adult, you will have to accept that the excitement of a sleeping bag, air mattress & a tent will mean that it is impossible to go to sleep the first night away camping when your 4. The fact that you did not go to sleep till 3 hours after your normal bedtime does not mean you will wake up 3 hours later, you will still wake up at 05:30. I would never have thought technology while camping would be necessary however the benefit of having a fully charged iPad and a collection of Peppa Pig episodes is a lifesaver at 05:30 in a very light tent. You could have an 8 man tent for 4 people, two of which our children but if it rains you will not have enough space to occupy those kids. Playing in the rain in raincoat and wellies is fun. You have just forgotten it now you’re old. I really hope this camping trip is the first of many camping trips to come, we did so many new things on the camping holiday but there are still so much more to do. My wife and I took our two on a week long summer camp when they were aged 2 and 3.5, they had a wail of a time and been avid campers ever since. You will also notice that particularly when they go camping with Cubs or Brownies (have you had that debate yet? ), they seem to grow up so much with every camp. My two have camped so often now they could run rings round most of my Scouts. Kids will always go to bed late and be up early, but that’s part of the fun of it. Plus your supposed to be knackered after camp, its a sign that you’ve enjoyed yourself. We’ve never taken technology with us on camp, you’ll find as your get older they’ll happily amuse each other chatting in the mornings. We also had an 8 man tent, although we found it was huge, but we were so glad to get rid of it as it weighed a ton. Look forward to your future camps you’ll have a great time, happy camping. I would agree as they get older they will be able to amuse themselves, they are already pretty good at it now and they do play together nicely most of the time. Fun post! Family camping is always a shock for the Scouter. Gone is the orderly march of program which can be a bit unnerving at first. I’ll admit that I tend to look at my watch a lot thinking I need to be someplace when I don’t! My nephew is now interested in camping so hopefully we can do a little more family camping in the future. Thanks for the comment – you have obviously not met my wife there was plenty of planning for them camp and almost a schedule of activities. Chris Kiff Meadows liked this on Facebook.